Spencer Nichols is probably best known as a designer of church windows and murals for Tiffany Studios. After his retirement from Tiffany he began easel painting around 1917 and found it challenging to transition from commercial to fine art. He moved to Bronxville at about the same time as his brother, Hobart, but relocated to Kent, Connecticut, in 1922 after his 10-year-old son Mather died of typhoid. Spencer returned to Bronxville for a brief period after a fire destroyed his Kent home and a large portion of his artistic output. Flowers in a Vase is a robust work, more expressionist or modern in feel than those of his Bronxville artist-neighbors. His colors are bright and luminescent, reminiscent of the jewel-like tones of the stained glass windows that he designed for Tiffany Studios. 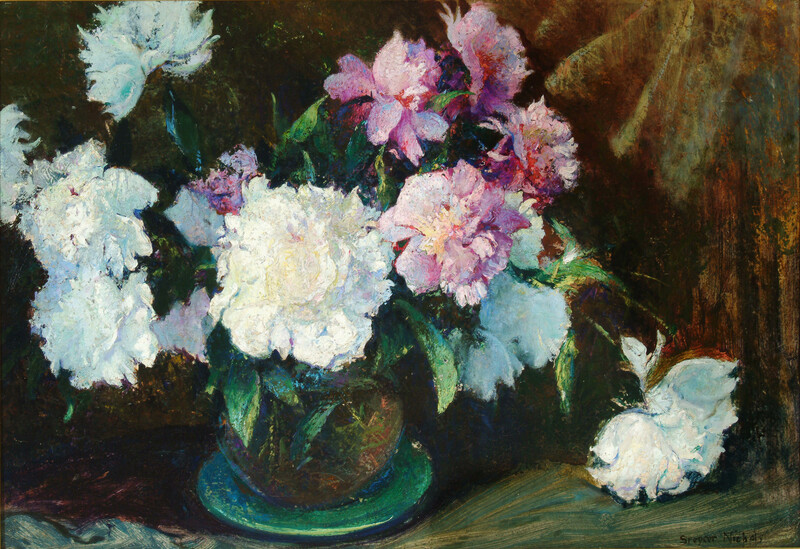 Helen Nichols, the artist’s wife, was an avid gardener — the peonies in the painting may well have been cultivated by her in Kent where the painting was executed.